Journal of Agricultural science and Botany is a peer reviewed, open access journal that aims to project the latest research discoveries and innovations in the field of agricultural science and botany. The journal aims to publish the recent original research as research articles, review articles, case reports, short communications, commentaries, images, video articles, etc. 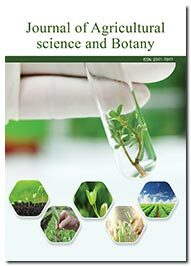 covering the vast spectrum of themes in Agricultural science and Botany and provides free online access to it globally. The journal meets the research needs of aspiring researchers and scientists across the world on a wide range of topics including crop science, modeling of crop, organic farming, agricultural biotechnology, agricultural economics, food science, plant and animal product quality, aquaculture, fishery, irrigation and water management, waste management, soil science, plant taxonomy, plant breeding, plant genomics, post-harvest technology, agro chemicals, pesticides, horticulture, land use, rural biodiversity, environmental impacts of agriculture and forestry, current agricultural practices and tools related to agriculture and botany. Manuscripts submitted are subjected to thorough peer-review prior to the publication in order to maintain the quality and significance of the journal. Published articles are made freely and permanently accessible online immediately upon publication, thus improving the author citations to attain impressive impact factor. Individuals interested in becoming part of the Editorial and Review board can contact at below mail id.